The University of Michigan Frankel Cardiovascular Center is one of several buildings that are part of the University of Michigan Medical Center campus. The official address of the Cardiovascular Center is 1500 E. Medical Center Dr., an address shared with many other Michigan Medicine buildings. Plugging in this address to a GPS may yield confusing results, so follow the signs as you approach the Medical Center to find the Frankel CVC. 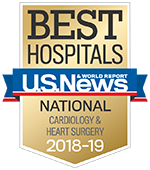 For better GPS results, you may use the Cardiovascular Center's unofficial street address: 1425 E. Ann St., Ann Arbor, MI 48109. (Please do not use this address as a mailing address.) For more specific directions, see Driving Directions below. To view street and floor maps of the Frankel Cardiovascular Center, visit our Street & Floor Maps page. To learn about road repairs and updates affecting Ann Arbor and the streets near the Frankel Cardiovascular Center and other locations with cardiovascular clinics, visit our Traffic Updates and Road Repairs page. If you need further help with directions, contact the CVC New Patient Coordination Center at 1-888-287-1082, Monday - Friday, 8am - 5pm, Monday - Friday. Directions from the North Take US-23 south to Geddes Rd. (exit 39). Turn right onto Geddes. Continue on Geddes for approximately 2 miles. Geddes becomes Fuller. Continue on Fuller for another 2 miles. Turn left at the light onto E. Medical Center Dr. Continue on E. Medical Center Dr. past the ER and parking structure P2, P3 & P4. Continue up the hill until you come to Observatory St. Turn right onto Observatory St. and enter parking structure P5. Directions from the South Take US-23 north to Geddes Rd. (exit 39). Turn left onto Geddes. Continue on Geddes for approximately 2 miles. Geddes becomes Fuller. Continue on Fuller for another 2 miles. Turn left at the light onto E. Medical Center Dr. Continue on E. Medical Center Dr. past the ER and parking structures P2, P3 & P4. Continue up the hill until you come to Observatory St. Turn right onto Observatory St. and enter parking structure P5. Directions from the East Take I-94 west to US-23 north (exit 180B) to Geddes Rd. (exit 39). Turn left onto Geddes. Continue on Geddes for approximately 2 miles. Geddes becomes Fuller. Continue on Fuller for another 2 miles. Turn left at the light onto E. Medical Center Dr. Continue on E. Medical Center Dr. past the ER and parking structures P2, P3 & P4. Continue up the hill until you come to Observatory St. Turn right onto Observatory St. and enter parking structure P5. Directions from the West Take I-94 east to Ann Arbor (exit 172). This merges into Jackson Road which becomes Huron St. Continue 2.5 miles east through downtown. At the traffic light at Huron and Glen, turn left onto Glen. After 1 block on Glen, turn right at the traffic light onto E. Ann St. Go 2 blocks and enter parking structure P5 at the top of the hill by turning left into the circular drive in front of the Cardiovascular Center .